14 May 2012. The past few days we visited Minnesota and Nebraska to see family before we take off for Rome this week. Funny how when we go back in the lovely spring or fall weather you forget how brutal the weather can be in this part of the country. We always manage to get to the Midwest when it isn’t 10 below zero or 98 with matching humidity. Good planning on our part. 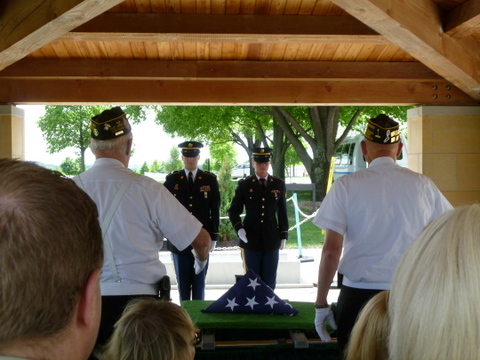 Honor guard at Mom’s interment. Veterans and active service-persons participate. Graduate Zachery with Grandpa and me. Our Nebraska stop was motivated by the graduation of our oldest grandson. Both of Ric’s kids and their families were present for the festivities, so a terrific chance to see everyone in one place. Graduating senior Zachery is the second-highest rated batter in the high school league in Nebraska, and we were able to see game one of the tournaments Saturday night. Zachery had 4 hits and the Skyhawks shut-out the opponents 6 to 0. Somehow fitting to spend an evening at an all-American type of sporting event just days before we leave the U.S. It was a lovely spring evening, surrounded by family, a hawk circling the sky over the diamond. My little spruce became a giant in 28 years. Of course visiting places one has lived before leads to reminiscing. We drove by our old house in Omaha, which I purchased as a single mom in 1984, a year before Ric and I married. 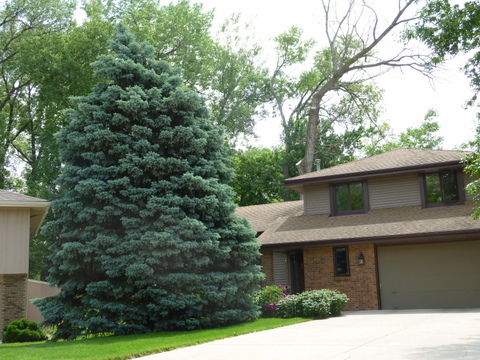 I had a little Colorado blue spruce planted in my yard that spring. It was so small – maybe 3 feet tall – that I, at 5’2”, towered over it. The first Christmas I was able to decorate it with a string of only 25 lights. Now look at it! Nice to see that tree has endured.